Week 50 (December 10-16) – Naughty. We all have an ancestor who probably received coal in their stocking. I’ve made a list, checked it twice, and found who’s been naughty and nice. If you’ve been following along these past two years you’ll know who’s locked the door to my most frustrating brick wall. Mr. and Mrs. DEMPSEY, my 3rd great-grandparents! What do I know about Mr. and Mrs. DEMPSEY? They were the parents of my great-great-grandfather William A. W. DEMPSEY born about 1820 in Virginia per the Fayette County, (West) Virginia census. He was seen as 28 years old in 1850 and 40 years old in 1860. He was also on the 1841 tax list of Rockbridge County which means he had to have been at least 21 yrs old at the time. 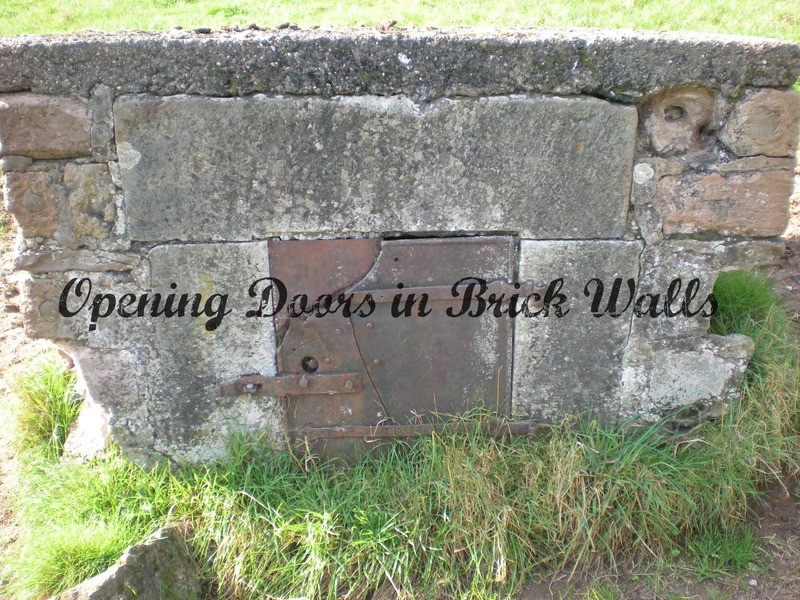 The door in this brick all is firmly shut and no one left the key under the mat! The most likely documents in which I might find the names of the parents of William A. W. DEMPSEY would be his birth, marriage and/or death record. Unfortunately, no death record has been found. This means no death record with names of parents or any kind of information to corroborate the family tradition of William’s dying in a logging accident in the late 1860s. This would have been after October 1866 when he was listed as having an account due, owing Joel B. Wills $8.50. By 1870 his children and wife were living (farmed out) in several different households. To date, no marriage record has been found for William A. W. DEMPSEY and Sarah Ann WOOD. Their first known child was born about 1846 placing their marriage in the early to mid-1840s. Sarah was from Fayette County and most of her siblings married in Fayette, one in Greenbrier and one in Kanawha. Virginia, Marriages, 1785-1940 at FamilySearch was consulted and the WVCulture.org site has been checked repeatedly as they continue to add records. I put a query to the Fayette County West Virginia Genealogy group on Facebook requesting information on the likelihood of loose marriage papers being in the West Virginia State Archives and/or at the county level. I also asked the group about the possibility of there being a marriage ledger for Hopewell Baptist Church. This church being a likely place for the couple to marry as Sarah’s great-grandfather Baily WOOD was a founding member. The church burned down in the 1960s and all records in the church were destroyed. There were some records kept at members’ homes and several people offered to ask around. I’m sure my father’s first cousin Geraldine Dempsey Workman (1931-2007) searched high and low in the 1970s and 1980s for more information on William’s parents and possible siblings. In 1995 she wrote “We still do not know his parents or family members” in a short summary of her research. For the time period William was born, ca. 1820-1822 there were no birth records as we know today. A Bible would be a likely alternative but none is known to exist. It is very unlikely one survived, if there was any, as the family did not live together after his death. Keeping with the Naughty theme, could it be Mrs. DEMPSEY was not a Missus? Should I be looking for a woman with the surname/maiden name DEMPSEY who had a son out of wedlock? This possibility has not been taken into consideration. The lack of birth, marriage and death records with the names of his parents means I need to use a different tactic to find the parents. Regrettably William A. W. DEMPSEY was born and spent his childhood during the pre-1850 census era and cannot be found in a census which included the names of all household members. I’ve followed the golden rule of genealogy and worked backward from myself to my great-great-grandfather. I’ve also traced his descendants forward to living relatives who may have the key I need to open the door in his brick wall. After doing traditional and reverse genealogy I analyzed the pre-1850 Virginia census of DEMPSEY families in which William A. W. DEMPSEY may have been born. Although 1810 is too early for William A. W. DEMPSEY it is interesting to see if the individuals found in 1820 were also in the same area in 1810. The 1810 census was lost for Orange County and tax lists have been used to reconstruct it. Location of misc. DEMPSEY individuals in Virginia and West Virginia in the early 1800s. Even before doing more serious research on the DEMPSEY lines found in Virginia I gave them names to identify and differentiate between them. Tandy did not have a young male in his household in 1820 or 1830. He was the father of John W., William S., Andrew S., Jane, Elizabeth, Mary B., and Margaret. These children are proven as they were mention as the children of Nancy Thompson, wife of Tandy, in chancery and land records in Nelson County. Tandy married Nancy Thompson in Amherst County on 19 January 1801. He lived in Rockbridge in 1810 and 1820 and moved to Logan County by 1827 where he was on the 1827 tax list and 1830 census. His son William S. was in Greenbrier County, (West) Virginia in 1830 and 1840. His son Andrew S. was in Logan in 1830 and in Lawrence County, Ohio, in 1840. William S. and Andrew S. both named sons William but have not been included in the census analysis as their sons were seen with them on the 1850 census. The known children of John W. do not include a son named William. John W. does not appear to be with his father Tandy in 1820. He married(1) in 1824 in Rockbridge, was not found in the 1830 census, and lived in Fayette County in 1840 through 1870. There are no known children for John W. and his first wife for the time period from their marriage in 1824 and until the birth of son John A. born abt. 1830 in Rockbridge. The 1840 census listing includes 1 male 10 & under 15 yo – this person is unaccounted for. ♦ actually younger than seen on the 1850 and 1860 census? ♦ the son of John W. and his first wife born before or soon after the 1824 marriage? ♦ the son of John W. and a relationship prior to his 1824 marriage? ♦ the son of John W.’s first wife from a previous relationship? This group has also been well researched as William DEMPSEY of Amherst was my 4th great-grandfather. His children are proven to be Wilson M., Seaton Y., Isham Coleman, Wesley G., Louisa J. and Eliza through land and court records produced after his death. In 1830, his wife Martha was listed in Amherst County with their two young daughters. There were no young males in the household. William at some time went to Ohio and did not return as newspapers in the state of Ohio were requested to publish information on his wife’s death in 1834. On 20 June 1836, a year after the last notice was published, William and Martha’s son Wilson signed an administrator bond for the deceased William. After the 1850 census, Wilson and Seaton moved to Fayette County. Their brother Wesley, who was not found in 1830 and 1840 censuses, was in Botetourt in 1850 and lived in Rockbridge from 1860 until his death in 1890. The children of William of Amherst were too young to be parent candidates for William A. W. DEMPSEY. I believe Tandy DEMPSEY and William DEMPSEY may have been brothers. Tandy married in Amherst less than a year and a half after William. There was also a Jane DEMPSEY who married Allen CAMERON in 1795 in Amherst. Allen CAMERON went bond with William DEMPSEY when William married which may suggest a close relationship. The CAMERON couple raised their family in Rockbridge. William’s mother Susannah DEMPSEY gave her consent for his marriage. No such record was found for Tandy and Jane. Daniel and his wife were past the childbearing years in 1820. His oldest son Thomas Allen was already married and had a son John L. The census numbers in 1820 for Daniel’s household show eight known children as well as his oldest son’s wife, their son, and possibly a daughter. Daniel was seen in Orange County as early as 1810 (tax list) but may have come from Caroline County where his first son was born about 1778 per death record. Could there be a connection between James DEMPSEY of Caroline and Daniel DEMPSEY of Orange? Daniel’s second son Lewis had a son named William A. born about 1825. This William A. DEMPSEY’s Civil War service was used to obtain a marker for my William A. W. DEMPSEY’s grave. The daughters of Geraldine, who did the paperwork for the marker, are aware of and have thought of rectifying the error. The next two groups have not been as thoroughly researched as the previous three. There are errors in online databases – a meshing of two generations and many Dempsey individuals found in Virginia in the early 1800s. I recently found chancery records on the Library of Virginia site which may help correct the errors in this line. William DEMPSEY Senr. died intestate before 12 February 1798 and his wife Jane died before 1826 (year of chancery case). He left heirs William Jr., John, Mark, and Mary, wife of Joseph Miller. John and Mark were not in the Commonwealth and Mary and Joseph Miller resided in Blackwater in Franklin County in 1826. 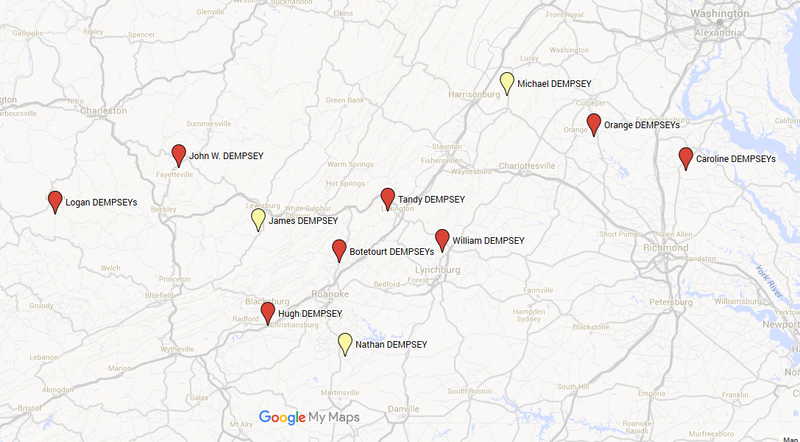 William Senr.’s line splits into what I refer to as the Botetourt DEMPSEYs and Logan DEMPSEYs. William Jr. died before 1806 and left widow Mildred “Milly” who resided in Fincastle; children: Elizabeth Dempsey resided in Fincastle, John and Samuel Dempsey outside of Commonwealth, Joel Dempsey and William Dempsey 3rd both decd/no issue, Absalom Dempsey in Fincastle, Dubartis Dempsey in NC, Judith the wife of Thomas Wilmore residing Giles court house, Susan wife of John Snyder residing in Christianburg, and Milly wife of David Campbell in NC. For William Jr.’s line there was only one son mentioned in the chancery records who remained in Virginia. Absalom Dempsey was a Baptist preacher; he and his wife did not have any children of their own. Hugh DEMPSEY seen in Botetourt in 1820 may have been a son of William Jr. and omitted in the chancery records. He was in Montgomery County, Virginia, in 1830 and went to Cooper County, Missouri, abt. 1838 and was seen there in the 1840 and 1850 census. He had a son named William R. b. abt. 1810 and, therefore, was not the father of William A. W. DEMPSEY. John was in Giles County in 1810, Cabell County in 1820, and Logan County in 1830 – all due to the changing country lines during the time period. The Logan DEMPSEYs are a complete puzzle to me even though John’s second youngest son Mark left a genealogical note written in 1889 which gives the names and approximate years of birth of eleven children of John DEMPSEY and Rachel SOLOMON. I am not sure how reliable the transcription of the note is as he wrote his mother died about 1849. I found Rachel DEMPSEY age 85 in the household of James DEMPSEY, possibly a 12th child of John and Rachel, in 1850. I’ve added pre-1850 census records for the Logan DEMPSEYs in my database but have not done extensive census analysis. Birth, marriage and death records need to be checked at WVCulture.org. Note: Many Logan County records were destroyed during the Civil War, and records were not kept for several years following the war. James DEMPSEY in Greenbrier (1791) was in the county as early as 1782. James Dymsey was seen as a resident of Greenbrier County in 1782 in Mr. Jas. Henderson’s District with 1 tithable, 3 horses and 4 cattle. In Oren F. Morten’s A History of Monroe County, West Virginia James Dempsey and wife Rosey/Rosanna are mentioned as having 375 acres of patented land on Second Creek in Greenbrier County, 180 acres patented by Dempsey and Ralph Gates in 1783 and 195 acres patented by Dempsey in 1787. Ralph Gates bought the 375 acres from James Dempsey and his wife Rosey Dempsey on 28 July 1795. A year later, on 6 January 1796 James and Rosanna Dempsey sold 100 acres to Mathew Lynn on Second Creek / Greenbrier River adj. Thomas Lewis and Ralph Gates, who was a witness. In 1808 David Henderson bought land from John and Agatha Stuart that adjoined land of James Dempsey. The 1810 census for Greenbrier is lost and James DEMPSEY was not found on the 1810 tax lists. He would have been 21 or older at the time he was first seen on the 1782 tax list. This would put his age in 1820 to over 59 years. It is unknown if they had children. No trace of him was found in Virginia after he and his wife sold land in 1796. 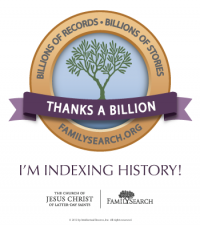 UPDATE: The Personal Tax List of Kanawha County was browsed on FamilySearch in January 2018. A James DEMPSEY was seen on the list for the years 1797, 1798, and 1800 suggesting he may have moved from Greenbrier to Kanawha after he sold land in 1796. Speculation: Could he be the same person as James DEMPSEY convicted in 1772 in London and transported to Virginia in January 1773 on the ship Justitia? ♦ Michael DEMPSEY in Shenandoah (1789) – Michael Dimsey md. Eliz. Barnhart in Shenandoah County on 17 Dec 1788. Another marriage seen in the county was Jane Dempsey to Jacob Savage on 1 Dec 1808. Was she a daughter of Michael? What do you think of my analysis of the census of the DEMPSEY families found in Virginia at the time of my great-great-grandfather William A. W. DEMPSEYs birth and childhood? Have I missed something that caught your eye? What else would you try? Mr. and Mrs. DEMPSEY don’t be naughty, please be nice and send some comments my way on how I can find out your names and what happened to you. © 2015-2018, copyright Cathy Meder-Dempsey. All rights reserved. 52 Ancestors in 52 Weeks – 2015 Edition. It was so successful in 2014 that genealogists wanted to continue or join in on the fun in 2015. 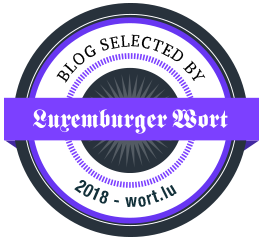 Be sure to check out the other great posts by visiting Amy’s blog No Story Too Small where she’ll be posting the weekly recap on Thurdays and allowing all participants to leave a link to their post(s) in the comments. That family belongs on the naughty list of genealogical research for sure! Your research is very thorough. Like you, I wish it would have resulted in a key for the door in this brick wall of ours. Merry Christmas cousin & thank you for all the research you do. You are my genealogy hero! Thank you Jessica! Merry Christmas to you and yours. Cathy, I enjoyed reading your post, since I live in this area of West Virginia. I am a hop, skip and a jump from Fayette County. Another great post, Cathy! Good luck cracking the Dempsey Code some day! Thanks Tim! I certainly hope it will be cracked one day SOON! Hello Edie, it sounds like you have the same problem with your Eliza Louise Dempsey, daughter of Andrew Dempsey, as I have with both my Dempsey lines. I have only concentrated on the Dempsey families of Virginia and later West Virginia so I won’t be much help on your line. I am seeing DNA matches who have Dempsey lines in the Carolinas but I have not followed through on them as I am busy with my families from Luxembourg at this time. Happy huntings and thank you for leaving a comment. Cathy, Eliza Dempsey was born in Cherokee Creek, Alabama, but the twist is my father’s family from Franklin, Virginia. Maybe she moved there and met my great-great-grandfather, Thomas Simmons.